Carolina Custom Pools is a custom concrete pool builder located in York, South Carolina and serving the greater Charlotte, NC area. Our owner, Andy Smith, has been building pools since 1973, providing extensive experience in pool manufacturing, distribution, design, and construction. As pool equipment and building processes have improved over the years, quality construction materials, quality workmanship, and quality supervision must still go into each pool project to ensure a high-quality finished product. 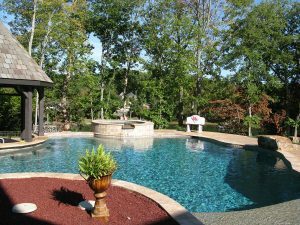 Carolina Custom Pools is your source for top-quality custom pools and more. Thank you so much for the beautiful job you did on our pool. Why Choose Us to Be Your Pool Builder? Carolina Custom Pools uses a stronger rebar design than most pool builders. We also use shotcrete mixed at the concrete plant, as opposed to cheaper gunite, which is mixed from a dry truck at the job site, to yield uniform strength throughout your pool shell consistently. Our shells have a limited lifetime warranty that far surpasses those offered by local vinyl and fiberglass pool builders. Our pool finishes include the premium Pebble Tec finishes that carry a 15-year warranty. We use sand-filtration and two-speed pumps for higher performance, greater cleanliness, and noticeable energy savings. All of our plumbing consists of separate, 2-inch PVC piping for higher efficiency and greater flow capabilities. We also offer salt sanitation systems, as well as the latest computer-controlled interfaces with hand-held remote controls. At Carolina Custom Pools, we go above and beyond to create the result you envision, whether it includes adding special features, pool lighting, or custom landscaping and hardscaping. You want the very best, and weâ€™ll deliver it.